From Middle English frute, fruit, fruct, fruyt, frut (“fruits and vegetables”), from Old French fruit (“produce, fruits and vegetables”), from Latin fructus (“enjoyment, proceeds, profits, produce, income”) and frūx (“crop, produce, fruit”) (compare Latin fruor (“have the benefit of, to use, to enjoy”)), from Proto-Indo-European *bʰruHg- (“to make use of, to have enjoyment of”). Cognate with English brook (“to bear, tolerate”) and German brauchen (“to need”). Displaced native Middle English ovet ("fruit", from Old English ofett; see English ovest), Middle English wastom, wastum ("fruit, growth", from Old English wæstm), and Middle English blede ("fruit, flower, offspring", from Old English blēd; see English blead). (often plural) In general, a product of plant growth useful to man or animals. Specifically, a sweet, edible part of a plant that resembles seed-bearing fruit (see next sense), even if it does not develop from a floral ovary; also used in a technically imprecise sense for some sweet or sweetish vegetables, such as the petioles of rhubarb, that resemble a true fruit or are used in cookery as if they were a fruit. The seed-bearing part of a plant, often edible, colourful and fragrant, produced from a floral ovary after fertilization. The spores of cryptogams and their accessory organs. [A]fter the flower is past commeth the fruit in long pods, every seede bunching out like the pods of Orobus and as bigge almost as the smaller Pease. His long nights in the office eventually bore fruit when his business boomed and he was given a raise. (attributive) Of, belonging to, related to, or having fruit or its characteristics; (of living things) producing or consuming fruit. (dated, colloquial, derogatory) A homosexual or effeminate man. (archaic) Offspring from a sexual union. Blessed art thou amongst women and blessed is the fruit of thy womb. The litter was the fruit of the union between our whippet and their terrier. a bowl of fruit; eat plenty of fruit; the tree provides fruit. berries, achenes, and nuts are all fruits; the fruits of this plant split into two parts. When fruit is treated as uncountable in the botanical sense, a piece of fruit is often used as a singulative. 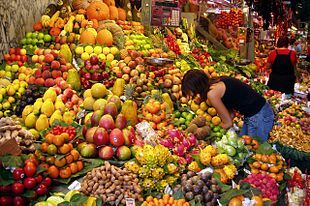 In senses other than the botanical or figurative ones derived from the botanical sense, the plural is fruits. The culinary sense often does not cover true fruits that are savoury or used chiefly in savoury foods, such as tomatoes and peas. These are normally described simply as vegetables. It may be said, however, that the percentage of green apples among the Fameuse seedlings is much less than among the others as out of 33 Fameuse seedlings which had fruited up to this year, none was green and we recollect but one light coloured Fameuse seedling fruiting this year. For example, chanterelles and russulas can start fruiting in early to mid summer given sufficient moisture, but other species, such as matsutake, rarely fruit until temperatures cool in the autumn, even if moisture is available earlier. The grass and weeds come up to my waist and the plum trees are already fruiting up, though most of the fruit'll go to the wasps and the worms, Vinny says, 'cause he can't be arsed to pick it. From Old Occitan [Term? ], from Latin fructus. From Middle Dutch fruut, froyt, from Old French fruit. From Middle French fruict, alteration of Old French fruit, from Latin frūctus (“enjoyment, proceeds, profits, produce, income”), a derivative of fruor (“have the benefit of, to use, to enjoy”), from Proto-Indo-European *bʰrug- (“to make use of, to have enjoyment of”). “fruit” in le Trésor de la langue française informatisé (The Digitized Treasury of the French Language).